To create the best fit for your clothing that you are designing and constructing would, start with taking correct body measurements which will determine a better fitting garment. Before you can go ahead and do all your styling it is important to understand your body measurements and identify your body imperfections, for example you might have very long legs and be short waisted, with long arms, and very narrow shoulders, and large bust. 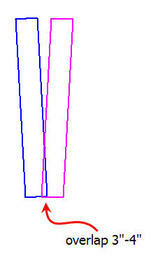 Most likely this would mean that standard commercial patterns won’t fit you when cutting just one straight size, chances you would have to alter, lengthen and perhaps cut more than one size in the pattern to get your perfect fit, which will once again give you an incredibly well fitted garment on completion, creating a more stylish fit, and boosting your cutting to size pattern and sewing confidence. Knowing your body shape will definitely assist in your pattern adjusting and manipulating for that superior final fit as well as understanding which styles suit your body shape best, to enhance all your good assets and to hide those you do not want to emphasis. Google more information whether you are apple shape, hourglass shape, rectangle pear, pear shape, inverted triangle, as well as your body frame, tall petite, broad shoulders, flat chested, etc. Understanding all aspects of your body frame and bone structure gives you more information to research around these body imperfections and to design styles that suit these body shapes, and so on. Collect fashion magazines, cut out and paste creating your own fashion style vision board with all the styles and details you like, which you can refer back to for ideas and inspiration. Next, step would be to be honest with yourself, do you like your current style rate this from 1 to 10? Have you outgrown your style or never really made much effort before? Perhaps you have pick up or lost weight? The most inexpensive way to test your true fashion style would be, to go to your local mall clothing retail stores and try on different styles and colours of items. Take photographs of you wearing these styles for later reference, this allowing you time to asses and absorb the styles you thought you would never wear but looked great on you. Now, you have done your research you can go through your pattern selection or make up a list of which patterns, fabrics and colours you would need. Start a sewing planner for your new style project. Check out my website www.taniasutherland.co.za for my SEWING PLANNER eBook, which has more detailed information elaborating with more detail than these few pointers to guide you along. Use the template to draw your designs and fashion sketches when preparing your collection or range. have you made a convertible dress? do you want to see other convertible dresses, share ideas on how to make them, and find ways to make your convertible dress even better? then hop over to flikr and join the convertible dress group! PLEASE NOTE: the instructions for making this dress are available for free but are not to be used for commercial purposes. please do not sell dresses made using these instructions, and do not make copies of the instructions without asking my permission first. thank you! over on the craftster forum we’ve been talking about variations on the infinity dress by lydia sylvestry. this type of dress has been around at least since the 1970’s–i distinctly remember reading an article about dresses of this type in cosmopolitan magazine when i was about 14 years old–and i recently bought a pattern for something similar. recently this kind of thing has come back into vogue–spegiel’s catalog currently has a collection of pieces by norma kamali called “convertible pieces“, and boston proper has a skirt they call a “three-in-one” (they used to have a four-in-one dress but it isn’t on their website anymore). 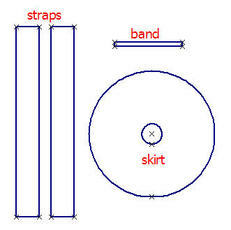 you need four pieces: a circle for the skirt, two straps, and one piece for a “waist” band. 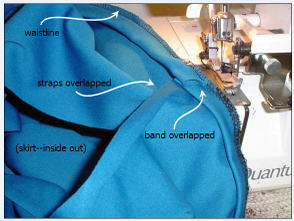 to decide how wide to make your straps, measure from the center of your bust to just under your arm. to figure the length i just decided on 1.5 times my height, which i rounded to 90″ because that was easier to figure out than 64.75 X 1.5. 🙂 the skirt length is your choice. the band needs to be a little longer than your waist measurement–i didn’t measure the length of my band, i just sewed it on and cut it off when i had gone all the way around the waist. this is the one and only seam. the whole thing took less than an hour from start to finish. (i didn’t do any edge finishes or even a hem on this dress because i was just playing around with the design but i definitely will be making more of these and i will do the niceties on subsequent versions.) here are a few other ways to wrap that i came up with this morning, and if you go to any of the sites i mentioned at the start of this post you can see dozens more ways to wear it. 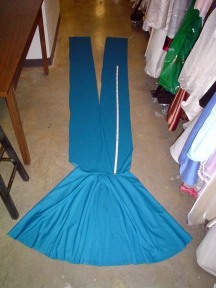 the fabric i used is some polyester knit that was donated to the costume shop last fall (thank you mrs. shay!). it has about 40% stretch on the cross. i cut the straps so the stretch is parallel to the short ends, because i didn’t need them to stretch longer but i did need them to shape around my body. i have been asked if the fabric could be 4-way stretch and i think it would work just fine, but the straps might behave differently, depending on how much stretch was on the length. i have also been asked if a non-stretch fabric would work, and i think it might–you’d have to cut the skirt so that it was large enough in the waist to pull on, or put a zipper in it. i’m going to experiment and see what happens (and you know i’ll post about it). another question i was asked is how i figured out the length of the straps. honestly, i just took a stab at it–i wasn’t sure the dress needed straps that long but figured i could always cut them shorter. about the math: i don’t do complicated math. 🙂 i just settled for a number that was close enough–if i were trying to build a space shuttle, i’d be a little more precise. Learning new skills, for self-development or turning your new skill into your new business! WHAT ALL WILL I BE LEARNING ? who require the skill and knowledge to construct your designs into functional and fitting garments, understanding how to sew, and to show your team of seamstresses how to put together your patterns completing your style into a complete garment with good quality tailoring and sewing techniques and finishing off the garments, providing your clients with greater service of detail and customized fits. Further, more how to turn designing into a business finding true path in the fashion world that suits you best, to follow your purpose into your future of fashion. who want to learn more sewing techniques, pattern manipulation and creativity to improve on your professionalism in your business. to sew your own styles that suit your body shape and fashion personality in colours that add flair to your wardrobe and suits your skin tone and joining the creative workshops of handbags, lingerie, creative re-fashioning your wardrobe into interior decorating inspirations around the house. Domestic staff teaching you to become self-sustainable when they ready to retire from your services. Learning new or improving on your sewing skills from: (1) basic alterations as simple as stitching on a button, shortening hemlines – which is 6week course. Or (2) More advanced sewing skills from basic levels of sewing making up clothes from patterns, adjusting your commercial patterns into different styles, adjusting your patterns and styles to fit your clients with perfection, adding an extra touch of designer creation and knowledge of which styles with the correct lengths and fits suit their body shape & personality complimenting their lifestyle the best. For teenagers inspiring and motivating your creative flair in fashion and interior décor, from making bling and designer tote handbags, to revamping and refashioning your clothing old denim jeans and jackets into new arty-boho creations, learn how to make matching jewellery sets, plus table décor layouts to impress mom, family and guests, and stenciling your designs with fabric paint onto your clothing. Offering a career opportunity to those who desire to become a professional seamstress, dressmaker or designer, learn how to turn your talents into a business. These courses are to develop entrepreneurial preparations for students to start their own business, providing the hands-on skills, knowledge and new business start-up to become self-sustainable and financially independent. This is up to you! Or you just love spending time on your weekly self-development and creative juices that feed your soul for the love of sewing and designing. Classes will be closed on public holidays and religious days – no making up for these classes. When are the Classes Available? Preparation of garments – ironing and pressing iron on stiffener is to be done before arriving in class. Workshops costs are they Seperate Classes? WORKSHOPS COSTS ARE THEY SEPARATE CLASSES? Workshops are for the public/everyone, not part of the sewing class modules, these are to help teach others in specific area’s of skills and crafts that I offer. These are separate costs to be paid seven days before date of workshop to prepare for kits.